AGRIFARM lubricants have proved extremely successful even under the very thoughest conditions and thereby offer the highest level of reliability for your vehicle fleet. Noticeably increased oil change intervals in engines and significantly fewer signs of wear are just some of the visible results. Our expertise guarantees the greatest reliability. AGRIFARM is the worldwide specialist for high-end lubricants. FUCHS offers all lubricants for the agricultural vehicle fleet: Whether greases for bearings on vehicles and work machines, hydraulic oils for a wide range of applications or engine and transmission oils for all vehicles in the yard and in though field conditions - with a wide range of specially developed lubricant solutions FUCHS AGRIFARM offers an optimal all-round protection for your machines. With the FUCHS UTTO and STOU multifunctional oils, lubricants are also offered that allow the rationalization of oil types even in mixed fleets and guarantee the highest quality. 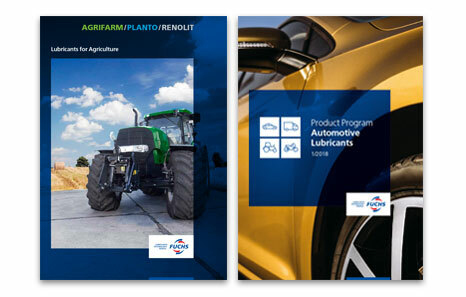 AGRIFARM products from FUCHS are high-end lubricants of the highest quality, which meet the latest standards of leading manufacturers in terms of application safety. For the production of AGRIFARM lubricants, FUCHS uses only selected base oils and specially developed additives. Further information about the extensive product program from FUCHS can be found here.